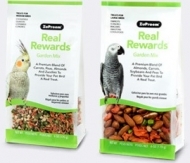 Real Rewards Garden Mix. 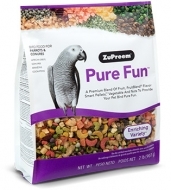 Available for cockatiel and parrot size birds. Real Rewards Orchard Mix. Available for cockatiel or parrot size birds. Real Rewards Tropical Mix. Available for Cockatiel or Parrot size birds. 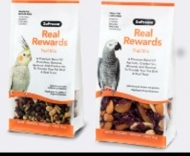 Real Rewards Trail Mix. Available for Cockatiel or Parrot size birds. 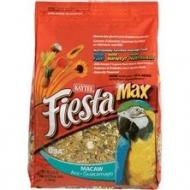 KAYTEE® Fiesta Max™ Premier blend of fruits, vegetables, seeds and grains offering maximum variety, fun and nutrition! An all fruit mix (no fillers) that includes human grade dehydrated pineapple, papaya, raisins, coconut, banana chips, apples, dates apricots and strawberries! An excellent substitute for fresh fruits! Formulated for canaries and finches to encourage the birds to sing. Also a superb feather conditioner and stress reliever with its rich blend of exotic seed that includes thistle, anise, hemp, lettuce seed, poppy, flax, sesame, whey, soybean, casein, lecithin, fish oil, wheat germ oil, canary seed, oat groats, and German millet. 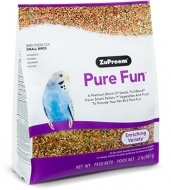 A rich, unique seed and small fruit bits blend specially formulated for the smaller bird. Blend includes German millet, canary seed, oat groats, flax, hemp, poppy, red millet, sesame, anise, lettuce seed, apples, strawberries, papaya, pineapple, blueberries, coconut, apricots, carrots and parsley. Clusters of golden millet right off the sprays. 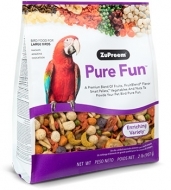 Can be fed in a separate treat cup or mixed with the bird’s food for an added treat. Birds of all sizes go crazy for this natural treat. A healthy, holistic blend of leafy greens, chamomile and herbs and cinnamon. 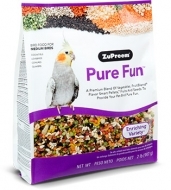 Great to sprinkle over your companion bird’s diet. High in plant proteins. Contains alfalfa petals, basil leaves, whole bee pollen, chamomile flowers, chives, leeks, parsley, rosemary and cinnamon powder. 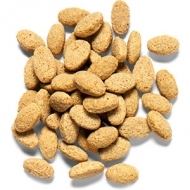 Sunburst Gourmet Natural Treats are a healthy complement to your pet's regular diet. 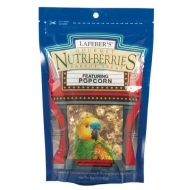 Boca Nuts give parrots and macaws a blend of assorted, shelled nuts with dried fruit. Shelled almonds, cashews, and walnuts along with dried papaya, bananas, coconut and more all add variety to your pet's daily diet. 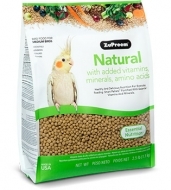 A premier Gourmet avian diet that is loaded with more natural goodies than anything on the market! 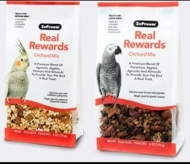 You’ll be impressed by not only the premium quality of the ingredients but the quantity of select natural treats. 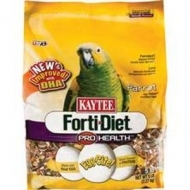 The premier Gourmet avian diet that are loaded with more natural goodies than anything on the market! 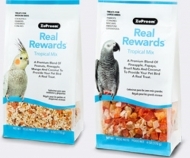 You’ll be impressed by not only the premium quality of the ingredients but the quantity of select natural treats.